Back in the mid-1800s, a young Ole Habberstad immigrated from Norway, together with his parents and siblings, to Lanesboro. In 1892, after achieving success in the building materials business, he began construction on a stately Victorian home. His home is now the Scandinavian Inn, a bed and breakfast named for its Norse heritage. With his wide array of building materials to choose from, Ole saw to it that his home featured ornate Southern pine woodwork, multiple stained glass windows, hardwood floors, high ceilings, hot water radiator heat, transom windows, spacious grounds, and an inviting front porch. Still retaining all of its original charm, the Scandinavian Inn today includes additional guest rooms, air conditioning, several outdoor seating areas, and a picturesque rooftop gazebo, all of which preserve its nineteenth century style and character, both inside and out. 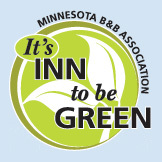 Residing in a quiet neighborhood, decorated with a pleasant mix of period furnishings and travel mementos, the Scandinavian Inn is well-regarded for its warm hospitality, socially- and environmentally-aware operation, and magnificent breakfasts. Guests are welcome to use the numerous indoor and outdoor common areas. Lanesboro itself is a most captivating small town tucked into the Root River valley, with professional live theater, excellent restaurants, an historic waterfall, a verdant central park, and an active arts community. Lanesboro is the hub of one of Minnesota’s most popular and scenic bicycle trails, offering three different routes of travel. Amish neighbors produce goods such as furniture, quilts, and preserves, which are available for purchase in Lanesboro and locations nearby.